In the mithraeums excavated so far, we find statues of a number of figures. These include Mithras, and his associates Cautes and Cautopates; and also sometimes other standard deities like Mercury. 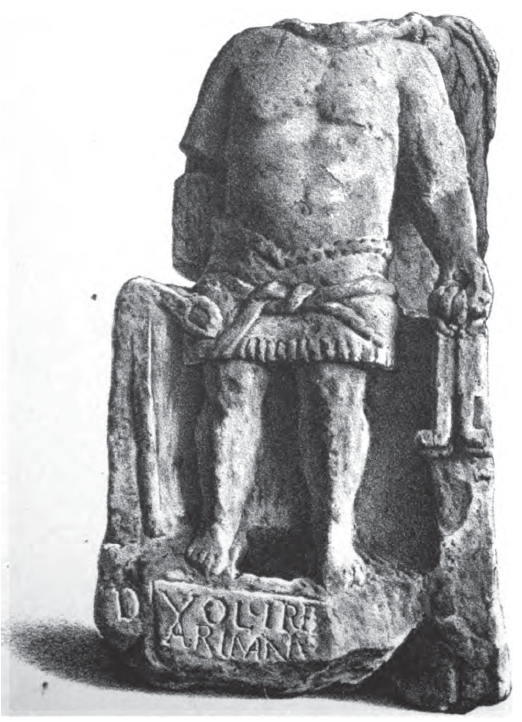 In a significant number of mithraeums, there is a statue of a bizarre figure, whom it is difficult to identify. The iconography of this figure is not always consistent. In a great number of cases it is a male figure with the head of a lion (sometimes instead with a human head but the lion's head on its breast), wings, and with the body of a serpent twined around it. Often it carries keys in both hands, which it presents in front of it. There are no painted depictions of this figure, and it is not referred to in the literary sources. Only one of the statues, CIMRM 833 has a fragmentary name on it. 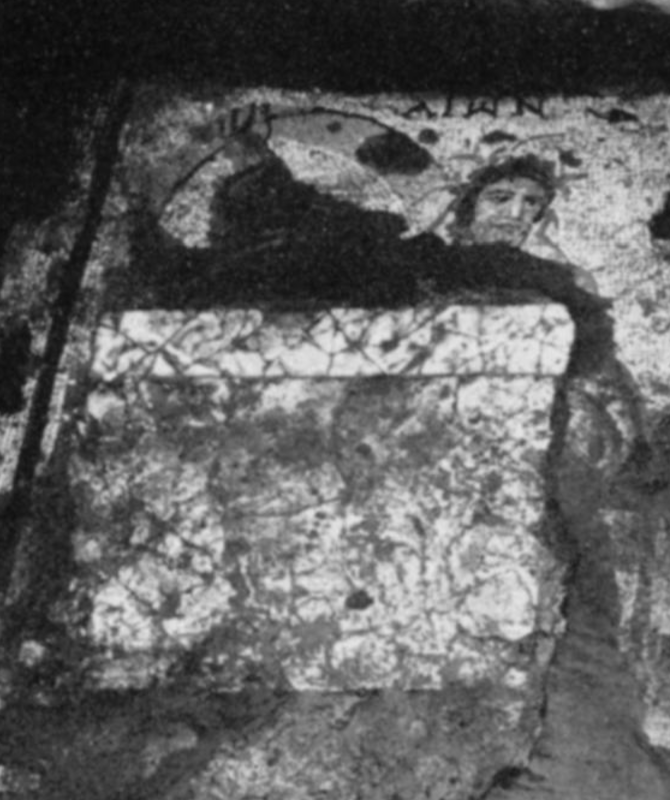 This appears to be "Areimanius", but this may be the name of the donor of the monument. But as for the third principle after the two, it arose from these, I mean from water and earth, and it is a serpent with the heads of a lion and a bull grown upon it. and in the middle the countenance of a god, and it has wings on its shoulders, and the same god is called Ageless Time [Aion], and Heracles. However this is a very late source indeed, and may not refer to anything known in the Roman world five centuries earlier. Here are some of the monuments of the lion-headed god. CIMRM 78-79 - Lion-headed statuette. Sidon. In the Louvre. CIMRM 94 - Lion-headed statue. Memphis, Egypt. CIMRM 102 - Lion-headed statuette. Apollinopolis (? ), Egypt. CIMRM 103 - Aion. Oxyrhynchus, Egypt. CIMRM 185 - Unknown - Aion? S. Capua Vetere, Italy. CIMRM 312-313 - The lion-headed god, Rome. CIMRM 314 - Lion-headed god from Ostia. Vatican museum, Rome. 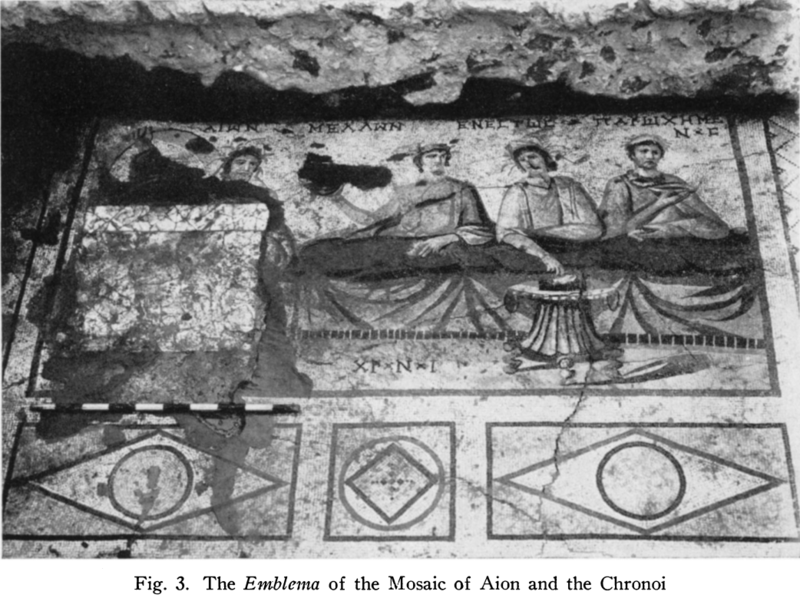 CIMRM 545 - Aion, Museo Gregoriano Profano, Vatican Museums. CIMRM 611 - Drawing of lion-headed god. Vatican ms.
CIMRM 665 - Lion-headed god. Florence, Italy. 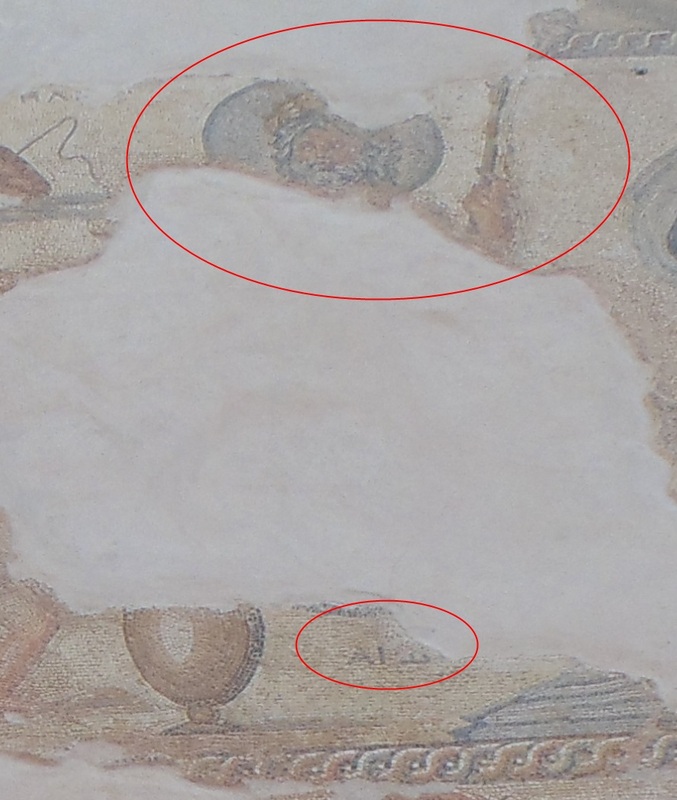 CIMRM 695-696 - Phanes and the egg, from Modena, Italy. CIMRM 776 - Lion-headed god. Merida, Spain. CIMRM 777 - Aion. Merida, Spain. CIMRM 833-834 - Lion-headed statue from York, Britain. CIMRM 855 - Aion (?). Housesteads, Britain. CIMRM 902 - Aion. Vienne, France. CIMRM 1138 - Lion-head of statue from Bonn. Altar with lion-headed god. Bordeaux, France. Statuette of lion-headed god. Unknown location. 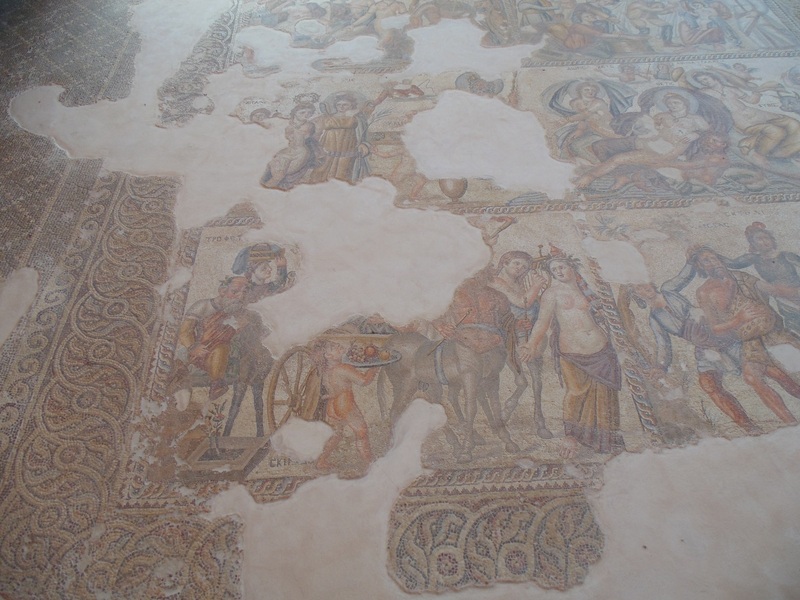 This mosaic dates from the 3rd century A.D. Published in Jahrbuch, IV, 1889, pp. 227 f., pl. 7. No date is given in Levi. Damascius, Dubitationes et solutiones de primis principiis, 1889, vol 1, p.381. Eng. tr. Sara Ahbel-Rappe, Damascius' Problems and Solutions Concerning First Principles, Oxford University Press, 2010, p.416. Doro Levi. "Aion" in Hesperia 13 (1944) 269-314. JSTOR. Detailed discussion of the iconography of Aion, a personification of time. 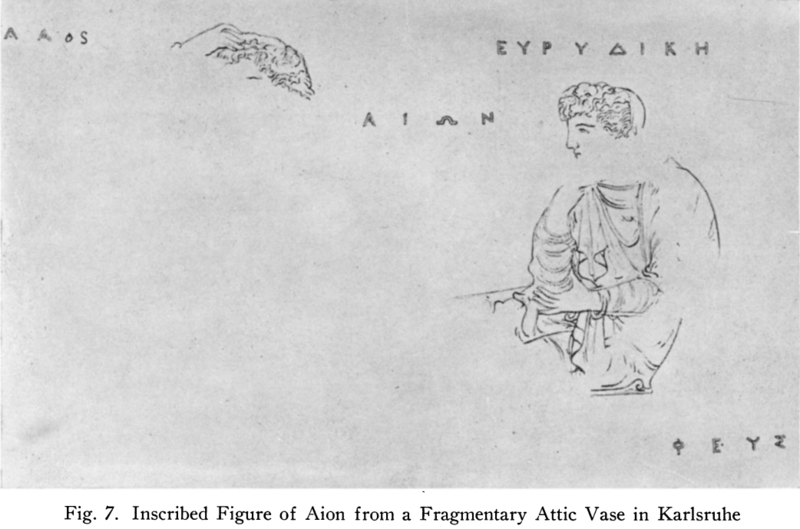 R. Pettazoni, "Aion-(Kronos)Chronos in Egypt", Essays on the history of religions, Brill, 1967, 172. E. Breccia, "Un 'Cronos mitriaco' ad Oxyrhynchos", Melanges Maspero II.2 (Le Caire: IFAO, 1934-37) p....? Helena Maria Keizer, Life, Time, Eternity: a study of AIΩN in Greek literature and philosophy, the septuagint and Philo, Diss. University of Amsterdam, 2010. Online here. Lise Vogel, The column of Antoninius Pius, Harvard University Press, 1973, p.35. 1 Sara Ahbel-Rappe, Damascius' Problems and Solutions Concerning First Principles, Oxford University Press, 2010, p.416. The full passage reads: "123.2. The Theology of Hieronymus or Hellanicus. The theology according to Hieronymus or Hellanicus, even if the latter is not the same personage, is as follows. In the beginning, he says, there were water and matter, from which earth was coagulated, and these he establishes as the first two principles, water and earth, the latter as capable of dispersion, and the former as providing coherence and (III 161) connection for earth. He omits the single principle (before the two) [on the grounds that it is] ineffable, since the fact that [Hieronymus] does not even mention it, shows its ineffable nature. But as for the third principle after the two, it arose from these, I mean from water and earth, and it is a serpent with the heads of a lion and a bull grown upon it. and in the middle the countenance of a god, and it has wings on its shoulders, and the same god is called Ageless Time, and Heracles. And Necessity is united with it, which is the same nature as Adrasteia, stretching the arms of its bimorph body throughout the entire cosmos, touching the very boundaries of it. I think that this is said to be the third principle that functions as their substance, except that they represent it as male-female in order to show that it is the generating cause of all things. In my view, the theology in the Rhapsodies has omitted the two first principles together with the one before the two, which is transmitted through [their very] silence [about it], and begins from the third principle after the two, since that principle is the first principle that can be expressed in language, and is commensurate with the human capacity to hear. For the highest principle in that theology was Ageless Time (Chronos), [who is] the father of Aither and Chaos. Without question, according to this theology, too, Time (Chronos) as the serpent begat a triple offspring: Aither. which he calls "watery," and indefinite Chaos, and third after these is misty Erebus. ...". See also the extended excerpt of the same passage translated by Thomas Taylor, here. 2 Nonnus, Dionysiaca VII, 22 ff. Tr. Loeb. Via. Levi, p.276. 3 G. Zoega, Bassirilievi antichi di Roma, II (Rome, 1808), pp. 32 ff., pl. LIX. Reference from Doro Levi. Statement is from Pettazoni, "The monstrous figure of time in Mithraism", l.c., p.182 who gives no reference. Pettazoni volume contains some images, which Google Books have kindly omitted. The most interesting of these is a reference to "E. Breccia, Memoires de l'Institut Francais d'Archeologie Orientale, 67: Melanges Maspero, II, Cairo 1934. Oxyrhynchus relief." 5 Antioch and Karlsruhe are from the Doro Levi article. The Paphos photos are by David Allsop.